Pictured below: Gary and his wife, Kay, at Soccer City for the 2010 World Cup of Soccer in South Africa. It is well known that South Africa has produced some of the all-time greats of golf, cricket and rugby - golfers Bobby Locke and Gary Player, cricketers Mike Procter and Graeme Pollock, and rugby players Frik du Preez and Naas Botha are among those that spring to mind. 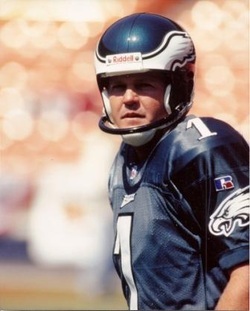 Less well known is the fact that a man seemingly destined for American football's Hall of Fame, the scorer of the most points in the history of the NFL - the professional American football league that culminates in the spectacular Superbowl every year - was born in Parys and raised in Durban, South Africa. 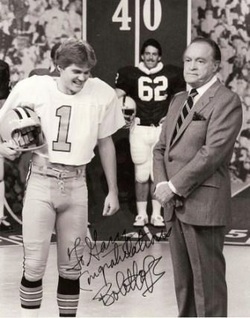 Gary, on the Bob Hope Show, after being selected for the "All American College Football Team in 1982"
Place-kicker Gary Anderson retired from the N.F.L. 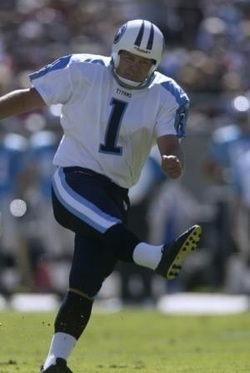 on Sunday, a day after his 23rd season ended in the Tennessee Titans' 17-14 divisional playoff loss at New England. ''That's a great group of guys here, both coaches and players, that made it a lot of fun for me and my boys,'' he said. ''I'm really pleased that I came and played for the Titans." 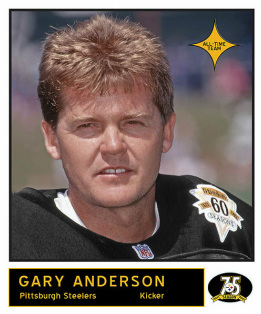 Anderson, 44, left a trout stream in Colorado in September to sign with Tennessee for one last chance at the Super Bowl. Anderson, the N.F.L. 's career scoring leader -- in the regular season and the postseason -- had only two extra points in his final game. 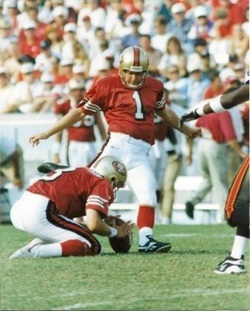 His only field-goal attempt, a 31-yarder, was blocked by Richard Seymour. overtime was the difference in a 26-23 upset win for the Steelers. PLEASE NOTE: Requests for autographs available only through official autograph signing events. Thank you for your cooperation.